“Glasnost” is on everyone’s lips, but the rules of the game haven’t changed for either side. When a beautiful Russian woman foists off a manuscript on an unwitting bystander at the Moscow Book Fair, it’s a miracle that she flies under the Soviets’ radar. Or does she? The woman’s source (codename: Bluebird) will trust only Barley Blair, a whiskey-soaked gentleman publisher with a poet’s heart. Coerced by British and American Intelligence, Blair journeys to Moscow to determine whether Bluebird’s manuscript contains the truth—or the darkest of fictions. 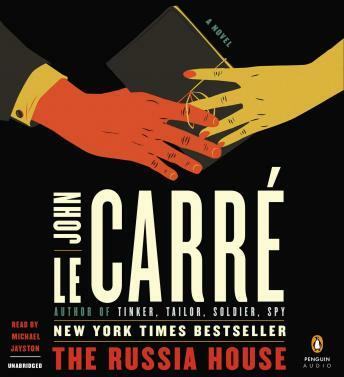 At once poignant and suspenseful, John le Carré’s The Russia House is a captivating saga of lives caught in the crosshairs of history. Michael Jayston really thrives as a narrator here, and the listening experience really enhances the book. This isn't my favorite novel by LeCarre, however, the Sean Connery movie regardless; the narrative meanders a bit too much, and the discursive thought makes shifting from one character to another difficult to follow. This seems to be a hallmark of the older Le Carre. Overall, this is still a great book, not only for the readerly experience but also because it is a poignant examination of how we perceive the Cold War in retrospect.